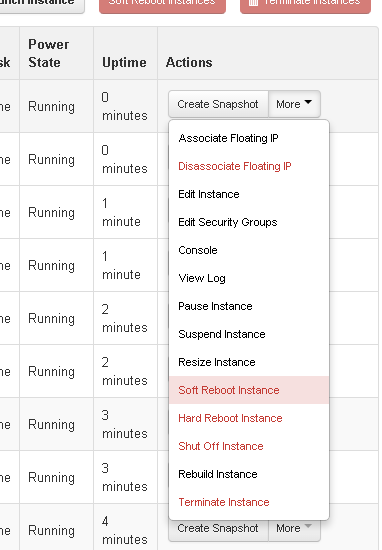 Is there any difference between performing an OpenStack soft reboot instance through the web interface Horizon and SSH into the instance and perform sudo reboot? Use this function to perform either a soft or hard reboot of a server. With a soft reboot, the operating system is signaled to restart, which allows for a graceful shutdown of all processes. A hard reboot is the equivalent of power cycling the server. The virtualization platform should ensure that the reboot action has completed successfully even in cases in which the underlying domain/VM is paused or halted/stopped. Not the answer you're looking for? Browse other questions tagged openstack or ask your own question. Cannot connect to Openstack Instance via horizon, but SSH works? Creating an instance with a specified name, or renaming an instance name after it got created? Which instances' states count toward the project's RAM quota on OpenStack? How is the image size calculated in OpenStack?